Welcome to the Michigan regional shape note singing site. For us, the first three notes, "do re me" are replaced with "fa sol la" and the ti with mi. This simplifies the relations between notes. Although there are some secular songs written in the shape note style, mostly all the songs are hymns, but a singer does not need to adhere to any religion to sing these songs. 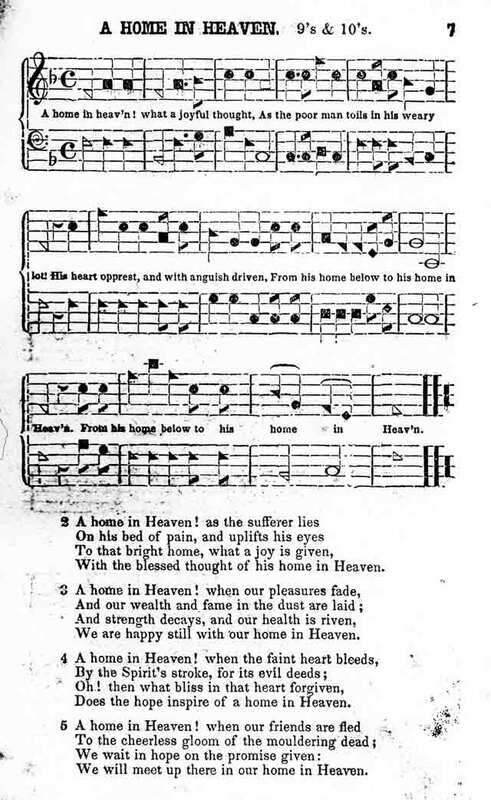 We sing out of the book called The Sacred Harp, which has been published continuously since the 1840s. The poetry is wonderful; the harmonies glorious. We are all singing for fun, not performance, so we don't always get it done "right," but we often do, and even those songs that aren't sung perfectly are still rewarding! The method by which we sing is to go around the square (we sit in a square with Trebles (sopranos and men who ), Tenors, Bass, and Altos each claiming a side), each singer picking a song in turn, calling out the page number. Those people gifted with being able to figure out the pitch of the song sing us know the starting notes (no pitch pipes or pianos, as we pitch it a little lower than concert pitch)! It is traditional for everyone to sing their part through once together, singing the shapes (that is, the names of the notes), and then we launch into the song. After that, the leader, who called the page to sing, identifies the verses that are to be sung, (since the songs often have many verses, we don't often sing them all, so that we can sing more songs) and then beats time (or has someone else do it for them) so that we sing together. Join Mid-Michigan singers on Facebook! just a few blocks North of Grand River. Depending on the number of singers, we meet in the vestibule of the Sanctuary, the Chapel, across from the Sanctuary, or the lounge outside the Sanctuary. Usually everyone arrives promptly at 7, so if you show up early, we won't be there to greet you. For more info, call 517-381-1321 (Bob) or email admin@fasolamichigan.org.